Baldur's Gate: Dark Alliance is a 2001 action role-playing/hack and slash video game developed by Snowblind Studios for PlayStation 2 and Xbox. It was ported to GameCube by High Voltage Software, and to the Game Boy Advance by Magic Pockets. The game was published for PlayStation, Xbox and GameCube by Black Isle Studios, a division of Interplay Entertainment, and distributed by Vivendi Universal Games. The Game Boy Advance version was published by DSI Games. CD Projekt was developing a version for PC, but it was ultimately cancelled. The game is set in the Forgotten Realms campaign setting of Dungeons & Dragons, and the gameplay is based on the rules of Dungeons & Dragons 3rd Edition, which were released in 2000. It is the first video game to implement the real time application of the new rules. It is also the first game in the Baldur's Gate series released on consoles as opposed to a PC and/or Mac. Dark Alliance was well received on all four platforms, with the PlayStation 2 version going on to win the Academy of Interactive Arts & Sciences award for "Role-Playing Game of the Year" (2001). A sequel, Baldur's Gate: Dark Alliance II, was released in 2004 for PlayStation 2 and Xbox. A third game was planned, but was cancelled early in development due to legal problems, and the closure of Black Isle Studios after Interplay went bankrupt. Gameplay in the PlayStation 2 version of Dark Alliance, showing Vahn fighting his way through the Marsh of Chelimber. His health and mana meters are at the top left of the screen. The empty meter between them is his experience meter. 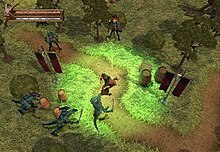 The console version of Baldur's Gate: Dark Alliance is a real-time hack and slash/action role-playing game presented in a 3D perspective, with a rotatable isometric three-quarter top-down view. At the beginning of the game, character stats are preset, with the player able to choose from three race/class combinations; a dwarven fighter (Kromlech), a human archer (Vahn) or an elven sorceress (Adrianna). The player can customize their character's stats through gaining experience points from defeating enemies. Every time the character increases in level, points are awarded corresponding to that level; i.e. if a character increases to level twelve, the player will gain twelve experience points to spend on the character's spells and feats. For every four levels which the character increases, the player is given one ability point to spend on one of the six core attributes (strength, intelligence, wisdom, dexterity, constitution, charisma). Each of the three characters have their own unique fighting style and their own specific set of spells and feats. Gameplay strategy is thus different for each character. As Kromlech is a fighter, his spells and feats tend to focus on increasing his brute strength and ability to resist damage, as well as granting him powerful abilities to aid in melee combat, such as the ability to swing his weapon in a circle or slam it into the ground to damage groups of nearby enemies. As Vahn relies on ranged attacks, his spells and feats tend to focus on increasing the power of his bow and granting him the ability to fire special types of arrows, such as exploding arrows, ice arrows or multiple arrows. As Adrianna is a sorceress, her spells and feats tend to focus on increasing the power of her magic and granting her numerous new spells, such as the ability to shoot ice or fire from her fingers, shoot a ball of lightning or call down meteors on her enemies. Gameplay is linear, and each main quest must be completed in sequence before the story can proceed, although there are some optional side-quests, which do not have to be completed immediately. However, all side-quests must be completed within the act in which they are assigned. There are relatively few NPCs in the game, with whom only those who are part of a quest or side-quest may be interacted. Weapons, armor and items are only available for purchase from one location at a time, and become increasingly expensive and more powerful as the game progresses. The HUD features the option to use either a transparent map that covers most of the screen, or a mini-map, with the player also given the option to turn the map off entirely. The game also features cooperative gameplay with another player. Both players share the same screen, and are thus limited in how far they can move away from one another. In co-op mode, the player who makes the kill gets 60% of the experience, and the other player gets 40%. Whichever player collects any gold drops gets 100% of the value, with the other player getting nothing. The game contains four difficulty levels; "Easy", "Normal", "Hard" and "Extreme". Extreme can only be unlocked after the player has beaten "The Gauntlet", a special mini-dungeon unlocked once the player completes the game on any difficulty level. The Gauntlet can only be played with Drizzt Do'Urden. Extreme mode takes the form of a New Game Plus, and can only be played by importing a saved character from another game. Once the player has completed Extreme mode, Drizzt Do'Urden becomes available to use in the main game. There is no choice as to the playable character. Instead, only a human male is playable, although his class can be chosen from three available (fighter, wizard, archer). After the completion of the game, a new class, "Elven Fighter," becomes available. Upon completion of the game, players cannot import a character to play through the story again; they must start a new game. There is no co-op mode. The town of Baldur's Gate is much more interactive, and players are able to talk to NPCs, enter houses, and use weapons (to break barrels, etc.). The town is split into two sections: North and South. The southern region cannot be entered at the beginning of the game. There are various new side-quests. Recall potions, which allow the player to teleport back to town to sell wares and then back to where they were in the dungeon, are not available. The ability to save the game is present at all times through the pause menu, and in-game save points are less frequent, usually appearing before act bosses. The GBA version lacks the experience meter from the console versions. The game takes place in the Sword Coast and the Western Heartlands, areas in the Faerûn continent of the Forgotten Realms. Each act of the game takes place in a different region: Act I takes place in the city of Baldur's Gate itself; Act II in the Sunset Mountains; and Act III in the Marsh of Chelimber. The game begins with Vahn, Adrianna and Kromlech arriving in Baldur's Gate, whereupon they are attacked by a group of thieves led by Karne (voiced by Michael Bell). The thieves are about to kill the trio when they are interrupted by the city watch, who take the newcomers to the nearby Elfsong Tavern to recover. There, the bartender, Alyth Elendara (Jennifer Hale), assists them in earning some money by giving them the job of clearing the tavern's cellar of rats. In the cellar, they discover the thieves are using the tavern's sewer entrance to infiltrate the city. When Elfsong Tavern employee Ethon, follows them into the sewers and disappears, they agree to Alyth's plea to find him. They rescue Ethon from the thieves, and he directs them to the nearby crypts, where one of the thieves was heading. There they encounter Fayed (Cam Clarke), a priest of Illmater, who requests their help in stopping the "Orb of the Undead", which has filled the crypts with zombies and skeletons. They succeed in destroying the orb and discover the thieves, collectively known as Xantam's Guild, are behind its placement. Ethon then introduces them to Jherek (John Rhys-Davies), a member of the Harpers, a group dedicated to protecting the realms from evil. Impressed with how they have handled themselves, he invites them to join the Harpers and destroy Xantham's Guild. They agree, and Jherek shows them the guild's entrance in the sewers. After navigating a gauntlet of traps they face and kill Karne, and then advance to find the guild master, the beholder Xantam (Tony Jay). He reveals the guild is only a small part of a much greater whole. They fight and kill him, and Jherek asks them to enter a portal which Xantam was guarding. The portal transports them to the Sunset Mountains, whereupon they head to a dwarf mining village, which is being oppressed by drow elves. They light a signal fire atop a nearby mountain, calling for aid from neighboring dwarven clans, and then enter the mines to rout the drow. After killing the drow priestess, they rescue a dwarven Harper, who tells them of another portal in the mountains. He also tells them that troops and monsters are planning to use the portals to move from the mountains into Baldur's Gate, attacking the city from within. The adventurers head to the portal, finding it guarded by the ice dragon Ciraxis. They slay him and pass through the portal into the Marsh of Chelimber. There they are greeted by Sleyvas (Kevin Michael Richardson), one of the native lizardfolk. He tells them of the nearby "Onyx Tower", and of its inhabitant, Eldrith the Betrayer (Vanessa Marshall), who has sworn vengeance against Baldur's Gate. He then reveals that his kin, led by the lizard Sess'sth, are serving Eldrith. The trio fight through the marsh's hordes of lizardfolk, kill Sess'sth, and cripple the lizard army. Sleyvas then leads them to the Onyx Tower, which they can only enter by taking a detour through the Elemental Plane of Water. Once inside the tower, they see firsthand Eldrith's preparations for war and fight their way upwards, through legions of Eldrith's soldiers. At the penultimate level of the tower they meet the ghost of Keledon (Dwight Schultz), first captain of the company of the Westering Sun. He explains that Eldrith once served Baldur's Gate as its greatest general, fighting a crusade against the Black Horde. Upon successfully defending the city, she defied orders and led her army in pursuit of the retreating Horde. Trapping them in a ravine, they proved stronger than she had anticipated, and she sent word to the city for re-enforcements. The re-enforcements never came, and Eldrith's army was defeated, although she survived. Furious, she rallied her remaining soldiers to attack Baldur's Gate itself, but was again defeated. The city's soldiers then pursued her and her few remaining men to the Marshes of Chelimber where they were all killed. However, Eldrith's rage was such that she returned to life, bringing forth the Onyx Tower, which gave her access to the portals. Seeking revenge, she orchestrated the attacks against Baldur's Gate, and created a dark alliance between Xantam's guild, the drow, and Sess'sth's tribes. Keleon explains that if the trio defeat Eldrith, it will mean the destruction of the Tower itself, as well as freeing the ghosts within. However, as they cannot leave the tower the way they entered, it will most likely lead to their own deaths. They find Eldrith alone on the roof of the Tower guarding another portal. She reiterates her plans for the destruction of Baldur's Gate. They fight and defeat her, and as she dies, she repents her actions and asks forgiveness. With the tower crumbling around them, the heroes enter the portal, not knowing where it leads. As the Onyx Tower explodes from within, Sleyvas' true motives are revealed: he has manipulated and used the heroes to defeat Eldrith for his unidentified master. He tells his master that the heroes have died within the tower and Eldrith is no longer an obstacle. As such, they can now proceed with their plans. Meanwhile, the trio emerge in an unknown forest, and are immediately surrounded by dark creatures who swoop upon them. The game concludes on this cliffhanger. We recognize the tremendous demand for a Baldur's Gate game on PlayStation 2. We're totally committed to making Baldur's Gate: Dark Alliance a completely original experience that both console gamers and RPG fans will enjoy. we are developing the game from the ground up to take full advantage of the sophisticated PlayStation 2 technology. Our goal is to push the hardware to its limits thus creating stunning environmental effects and highly detailed characters never before seen on the console. On April 17, Interplay confirmed that if the game was successful, a sequel would enter development immediately. The game was first shown at E3 in May 2001, where it gained critical acclaim, with IGN writing "it almost instantly became one of the most wanted games for PlayStation 2 owners across the country. The game's graphics are as good as anything else on the system. It's as simple as that. The lighting, shadows, textures, models, water effects, and reflections are all amazing to look at and are a testament to the power of PlayStation 2 and the skills of the developers over at Snowblind Studios." The game utilized a new game engine; the Dark Alliance Engine, which was built specifically for Dark Alliance, and would go on to become the foundation for other games on the PlayStation 2, such as Fallout: Brotherhood of Steel and The Bard's Tale. Graphically, the Dark Alliance engine is a major improvement over the engine used by the original PC Baldur's Gate games, the Infinity Engine. Infinity was only able to render 2D sprite characters and static environments. The Dark Alliance engine, on the other hand, made use of the PlayStation 2's advanced GPU, allowing for such improvements as dynamic lighting, real-time shadowing and 3D models of characters and environments. IGN wrote of the E3 presentation, "None of the problems that are commonly associated with PlayStation 2 games, such as low-res textures, flickering, or aliasing problems, are to be found here. It's hard to think of a game that pulls off the much-fabled anti-aliasing as well as this game does. Dark Alliance uses a technique similar to what a large number of Dreamcast games did to pull off their clean look: they simply render the scene at a much higher resolution, anti-alias it, then drop it down to a more acceptable resolution for TVs. The result is a beautifully anti-aliased game." On November 2, Interplay announced the game had been finalized and was ready for manufacture, with a release date set for November 12. The game entered the manufacturing stage on November 5. On November 8, IGN gave a full preview, again praising the graphics, and writing "This game is running on a rock-solid 3D engine with completely rotatable dungeons, brilliant animation for nearly every interactive element (of which there are many), and first-rate lighting effects of all different kinds [...] In the beginning, simple refined touches are impressive, amid the generally sharp atmosphere of the game (while there is no visible aliasing, the graphics aren't heavily filtered, either). Even when all you have to fight are rats, and all you have to fight with is a dagger, you can admire how barrels come apart when you smash them, in realistically shaded pieces and a puff of dust, or all the different limbs you can bloodily excise from your foes." The game was shipped by Black Isle Studios on December 3. With the success of the PlayStation version, the Xbox port, also developed by Snowblind, was announced by Interplay on May 17, 2002, with a demo released on May 31. The game was finalized on September 25. The GameCube version was officially announced on September 19, 2002, to be ported by High Voltage Software. The game was finalized on October 28. The Game Boy Advance port was announced by DSI Games on November 8, 2001. However, little more was heard of the title until January 15, 2004, when a rumor circulated that the game was finished, and was set to be published by Ubisoft. This proved inaccurate, however, with Destination Software ultimately publishing the title, which had been ported by Magic Pockets. Believing the game could also be a success on the PC, Interplay's Feargus Urquhart and David Perry contacted Polish developers CD Projekt. As Poland was known for only developing PC games, Urquhart and Perry believed Projekt would be the perfect team to port Dark Alliance to PC. Sebastian Zieliński, developer of Mortyr 2093-1944, which Interplay had published, was placed in charge of the project, with Adam Badowski, a film storyboard artist, hired as designer. A PlayStation 2 development kit was smuggled from Interplay's offices in London to Poland, and work on the port began. However, almost immediately, Interplay cancelled development. Baldur's Gate: Dark Alliance was well received on all four platforms. Metacritic records all versions as receiving "generally favorable reviews," with the PlayStation 2 version holding an aggregate score of 87 out of 100, based on twenty-nine reviews; the Xbox version 83 out of 100, based on twenty-five reviews, the GameCube version 79 out of 100, based on ten reviews, and the Game Boy Advance version 76 out of 100, based on seventeen reviews. IGN reviewed all four versions of the game. David Smith scored the PlayStation 2 version 9.4 out of 10, giving it an "Editor's Award" and calling the Dark Alliance engine "one of the best 3D engines yet devised." He dismissed criticisms of the game as a "Diablo clone," arguing the gameplay is much deeper than such a comparison suggests. His only criticisms were some anti-climatic boss fights and repetitive music. He concluded "There is honestly not a great deal to complain about here [...] Snowblind has put together one of the best engines on PS2 and one of the best hacks in the business, certainly the best a console has ever seen." Kaiser Hwang scored the Xbox version 8.5 out of 10. He praised the graphics, but wrote "What hurts this game's score is the fact that it is almost exactly the same game that was released last year, not that that's a bad thing. The game is a fine example of exceptional game-making. But an extra level or character, or really any added extras would've been great." Fran Mirabella III scored the GameCube version 7.5 out of 10, calling it "a downgrade from the PS2 version." He criticized the "bafflingly destroyed frame rate," and commented "When it was released on the PS2 a year ago, few could believe what Snowblind had pulled off on Sony's stubborn console. A year later, and quite magically, High Voltage couldn't get the engine running smoothly on GameCube." Craig Harris scored the Game Boy Advance version 8 out of 10, arguing that "Even though it's missing a few key elements from the original design it's based upon, Baldur's Gate: Dark Alliance works out very well in portable form." GameSpot also reviewed all four versions. Gerald Villoria scored the PlayStation 2 version 8.8 out of 10, praising the differences between the fighting styles of the three characters, the controls, the range of enemies and weaponry, and the lip syncing. He concluded "You can really appreciate all the work that went into making sure that all of the little things came together so nicely." Greg Kasavin scored the Xbox version 8.5 out of 10, calling it "one of the finest action RPGs ever made" and lauding it as "a perfect port." Kasavin scored the GameCube version 7.6 out of 10, finding similar faults to IGN's Mirabella. He called it "technically deficient" and argued "the visuals [...] just don't measure up, mostly because it suffers from frame rate issues that are nonexistent in the PS2 version (or the new Xbox version)." He concluded "the game just wasn't optimized for the system." Frank Provo scored the Game Boy Advance version 8 out of 10, praising the enemy AI, the sound and the graphics. He concluded, "If you're looking for a hack-and-slash game on the go, this is the one to get." GameSpy reviewed the Xbox and GameCube versions. Raymond Padilla scored the Xbox version 4 out of 5, writing "With the Xbox, the developers had a significantly more powerful tool to retell the story of Dark Alliance. Unfortunately, they didn't take advantage of it. There are minor visual and aural enhancements in this version. They're very slight and I'm sure many gamers wouldn't notice the differences." He criticized the lack of Xbox Live compatibility or any kind of downloadable content, arguing "the only improvements are superficial." However, he also wrote "Compared to competing titles, this is one of the best games available for the Xbox [...] I wholeheartedly recommend Baldur's Gate: Dark Alliance for the Xbox. It's not serving up anything new, but it's still a grand adventure." Christian Nutt scored the GameCube version 3.5 out of 5, calling it "a wonderfully entertaining game that doesn't quite live up to the technical quality of the PS2 original or its Xbox incarnation." He wrote "the graphics have taken a subtle but damaging hit" and criticized "the game's frame rate, which is passable if slightly sluggish most of the time, but chunks up quite perceptibly when you rotate the dungeon." He praised the gameplay, but wrote "for a gamer with a choice between platforms, the GameCube version is the one to avoid." In the mainstream press, Victor Godinez of The Dallas Morning News called the game "a blast to play." 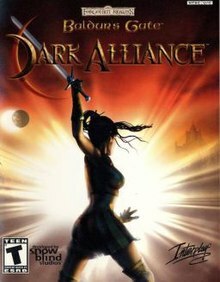 Billy O'Keefe, of the Knight Ridder Tribune wrote Dark Alliance is "all about action," opining that a pure RPG would not work on a console, and the additional action elements in Dark Alliance improved playability. John Breeden II of The Washington Post praised "the smaller number of more straightforward quests." Bob Low of the Daily Record called the graphics "flawless." Godinez also lauded the graphics, calling them "breathtaking." Breeden agreed, saying, "the graphics on the PS2 version are eons ahead of the PC series." Low's one complaint was that the game was too short. Breeden echoed this sentiment, arguing that players used to the longer PC games in the series might find Dark Alliance too brief. IGN ranked Baldur's Gate: Dark Alliance No. 7 on their list of "The Top 11 Dungeons & Dragons Games of All Time" in 2014. The game was a commercial success, selling over one million units across PlayStation 2, Xbox and GameCube. It won the 2001 Academy of Interactive Arts & Sciences award for "Role-Playing Game of the Year", defeating the hot-favorite, Final Fantasy X. It was later listed at #66 in IGN's "Top 100 PlayStation 2 Games". ^ "Baldur's Gate: Dark Alliance (PS2)". GameSpy. Retrieved September 6, 2013. ^ "Baldur's Gate: Dark Alliance (Xbox)". Amazon.co.uk. Retrieved January 25, 2016. ^ "Baldur's Gate: Dark Alliance (Xbox)". GameSpy. Retrieved January 25, 2016. ^ "Baldur's Gate: Dark Alliance (GameCube)". Amazon.co.uk. Retrieved January 25, 2016. ^ "Baldur's Gate: Dark Alliance (GameCube)". GameSpy. Retrieved January 25, 2016. ^ "Baldur's Gate: Dark Alliance (GBA)". IGN. Retrieved January 25, 2016. ^ a b c d Hwang, Kaiser (October 18, 2002). "Baldur's Gate: Dark Alliance Review (Xbox)". IGN. Retrieved August 24, 2013. ^ Butts, Stephen (December 16, 2003). "Black Isle Closure: The Inside Track". IGN. Retrieved September 7, 2013. ^ "Interplay Entertainment Corp 10-K for 12/31/05 EX-10". U.S. Securities and Exchange Commission. June 19, 2006. Retrieved August 24, 2013. ^ Avellone, Chris (2001). "Heroes of Baldur's Gate". Baldur's Gate: Dark Alliance PlayStation 2 Instruction Manual. Black Isle Studios. p. 8. S7145715. Retrieved February 22, 2016. ^ Avellone, Chris (2001). "Spells and feats". Baldur's Gate: Dark Alliance PlayStation 2 Instruction Manual. Black Isle Studios. p. 26. S7145715. Retrieved February 22, 2016. ^ a b Avellone, Chris (2001). "Character abilities". Baldur's Gate: Dark Alliance PlayStation 2 Instruction Manual. Black Isle Studios. pp. 20–21. S7145715. Retrieved February 22, 2016. ^ Avellone, Chris (2001). "Active feats". Baldur's Gate: Dark Alliance PlayStation 2 Instruction Manual. Black Isle Studios. pp. 28–31. S7145715. Retrieved February 22, 2016. ^ a b c Villoria, Gerald (November 27, 2001). "Baldur's Gate: Dark Alliance Review (PS2)". GameSpot. Retrieved August 24, 2013. ^ "Baldur's Gate: Dark Alliance Gauntlet Walkthrough". GameFAQs. Retrieved March 25, 2015. ^ Avellone, Chris (2001). "Controlling your character". Baldur's Gate: Dark Alliance PlayStation 2 Instruction Manual. Black Isle Studios. pp. 13–14. S7145715. Retrieved February 22, 2016. ^ "Baldur's Gate: Dark Alliance (PlayStation 2) Cheats". GameFAQs. Retrieved August 24, 2013. ^ a b c d Harris, Craig (January 29, 2004). "Baldur's Gate: Dark Alliance Review (GBA)". IGN. Retrieved August 24, 2013. ^ a b c Provo, Frank (January 28, 2004). "Baldur's Gate: Dark Alliance Review (GBA)". GameSpot. Retrieved August 24, 2013. ^ "Interplay Confirms Baldur's Gate II". IGN. November 7, 2000. Retrieved September 6, 2013. ^ Shahed, Ahmed (November 7, 2000). "Baldur's Gate on PS2". GameSpot. Retrieved November 11, 2011. ^ a b "Baldur's Gate Finally Confirmed". IGN. February 15, 2001. Retrieved September 6, 2013. ^ "Interplay Talks Finances, The Matrix, and Sequels". IGN. April 7, 2001. Retrieved September 6, 2013. ^ "E3 2001: More Praise for Baldur's Gate Dark Alliance". IGN. May 18, 2001. Retrieved November 11, 2011. ^ Meston, Zach (January 12, 2004). "Fallout: Brotherhood of Steel (PS2) Review". GameSpy. Retrieved August 24, 2013. ^ Padilla, Raymond (February 15, 2004). "The Bard's Tale (PS2) Preview". GameSpy. Retrieved August 24, 2013. ^ a b Smith, David (November 26, 2001). "Baldur's Gate: Dark Alliance Preview". IGN. Retrieved September 6, 2013. ^ Ahmed, Shahed (November 2, 2001). "Baldur's Gate PS2 goes gold". GameSpot. Retrieved September 6, 2013. ^ "Baldur's Gate: Dark Alliance Is Final". IGN. November 5, 2001. Retrieved September 6, 2013. ^ Ahmed, Shahed (December 3, 2001). "Baldur's Gate shipped for the PlayStation 2". GameSpot. Retrieved September 6, 2013. ^ "Baldur's Black Isle Ships Baldur's Gate: Dark Alliance". IGN. December 3, 2001. Retrieved September 6, 2013. ^ Boulding, Aaron (July 11, 2002). "Baldur's Gate: Dark Alliance Xbox Preview". IGN. Retrieved September 6, 2013. ^ Torres, Ricardo (May 17, 2002). "Baldur's Gate: Dark Alliance officially announced for Xbox". GameSpot. Retrieved September 6, 2013. ^ Boulding, Aaron (May 17, 2002). "Xbox and a Dark Alliance". IGN. Retrieved September 6, 2013. ^ Frankle, Gwen (May 31, 2002). "Baldur's Gate: Dark Alliance Xbox Hands On". IGN. Retrieved September 6, 2013. ^ Parker, Sam (September 25, 2002). "Dark Alliance for the Xbox goes gold". GameSpot. Retrieved September 6, 2013. ^ Parker, Sam (September 19, 2002). "Baldur's Gate: Dark Alliance for GameCube". GameSpot. Retrieved September 6, 2013. ^ "Baldur's Gate Official". IGN. September 19, 2002. Retrieved September 6, 2013. ^ "Baldur's Gate: Dark Alliance GameCube Preview". IGN. September 25, 2002. Retrieved January 21, 2016. ^ "Baldur's Gold". IGN. October 28, 2002. Retrieved September 6, 2013. ^ Ahmed, Shahed (November 9, 2001). "Destination Software confirms GBA, GameCube games". GameSpot. Retrieved September 6, 2013. ^ Thorsen, Tor (January 15, 2004). "Ubisoft to distribute GBA Dark Alliance". GameSpot. Retrieved September 6, 2013. ^ Purchese, Robert (November 7, 2013). "Seeing Red: The story of CD Projekt". Eurogamer. Retrieved November 7, 2013. ^ a b Kasavin, Greg (October 28, 2002). "Baldur's Gate: Dark Alliance Review (GameCube)". GameSpot. Retrieved August 24, 2013. ^ a b Kasavin, Greg (October 28, 2002). "Baldur's Gate: Dark Alliance Review (Xbox)". GameSpot. Retrieved August 24, 2013. ^ a b Nutt, Christian (December 13, 2002). "Baldur's Gate: Dark Alliance Review (GameCube)". GameSpy. Archived from the original on April 7, 2010. Retrieved March 23, 2015. ^ a b Padilla, Raymond (October 22, 2002). "Baldur's Gate: Dark Alliance Review (Xbox)". GameSpy. Archived from the original on January 23, 2013. Retrieved March 23, 2015. ^ a b Mirabella III, Fran (November 13, 2002). "Baldur's Gate: Dark Alliance Review (GameCube)". IGN. Retrieved August 24, 2013. ^ a b Smith, David (December 3, 2001). "Baldur's Gate: Dark Alliance Review (PS2)". IGN. Retrieved August 24, 2013. ^ "Baldur's Gate: Dark Alliance Review (GBA)". Nintendo Power: 119. March 2004. ^ "Baldur's Gate: Dark Alliance Review (GameCube)". Nintendo Power: 172. January 2003. ^ "Baldur's Gate: Dark Alliance Review (PS2)". Official U.S. PlayStation Magazine: 130. January 2002. ^ "Baldur's Gate: Dark Alliance Review (Xbox)". Official Xbox Magazine: 142. December 2002. ^ a b "Baldur's Gate: Dark Alliance (GameBoy Advance)". Metacritic. Retrieved August 24, 2013. ^ a b "Baldur's Gate: Dark Alliance (GameCube)". Metacritic. Retrieved August 24, 2013. ^ a b "Baldur's Gate: Dark Alliance (PlayStation 2)". Metacritic. Retrieved August 24, 2013. ^ a b "Baldur's Gate: Dark Alliance (Xbox)". Metacritic. Retrieved August 24, 2013. ^ a b "Baldur's Gate Wins Arts and Sciences Award". IGN. March 27, 2002. Retrieved August 24, 2013. ^ "Dark Alliance II Announced". IGN. March 24, 2003. Retrieved September 7, 2013. ^ "Top 100 PlayStation 2 Games". IGN. Retrieved November 15, 2012.